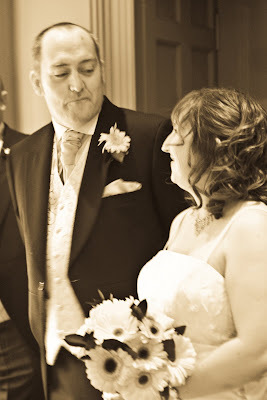 Yesterdays wedding was at Jesmond Dene House Hotel just on the outskirts of Newcastle upon Tyne. It's an absolutely gorgeous place to have your wedding or civil partnership and there are some lovely places around the grounds and inside the hotel for photographic opportunities. 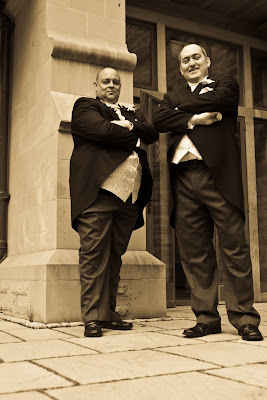 I arrived just before Kevin and his best man Karl, you can see them here hamming it up, trying to look menacing, you can tell they're softies at heart!! The intimate service was filled with emotion, Karen couldn't stop beaming whilst you could see the emotion building on Kevins face, the registrar was very very photo friendly and I managed to get some great shots during the service. Afterwards there were drinks all round and then off to the gardens for some photography, I actually got so many wonderful shots of this happy wedding party that I had a hard time discarding any from the final cut. 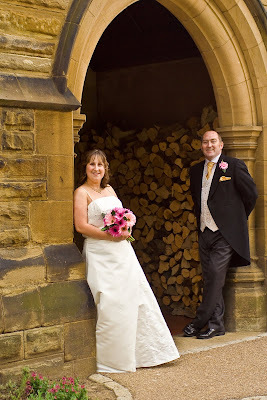 Whilst I was doing a reckie at the house I noticed a wonderful archway with piles of logs on either side of the entrance, I managed to pull Kevin and Karen away from their guests just for a short while but I'm pretty sure it was worth it for them as we ended up with some amazing shots like this one. If you're a friend or relative of Kevin and Karen and you want to view their private gallery then you'll need to visit my websites home page, scroll down and enter the password (surname)and you'll be able to view all 300+ photos. Once again if you are a lurking bride then just a reminder that my Wedding Photography packages start at only £295 and are totally customisable because no two weddings are alike. Also don't forget that if you book by the 30th of September you'll be entered into a competition to win a wedding album worth over £100, once again full details can be obtained by clicking on the contact us page of my website.